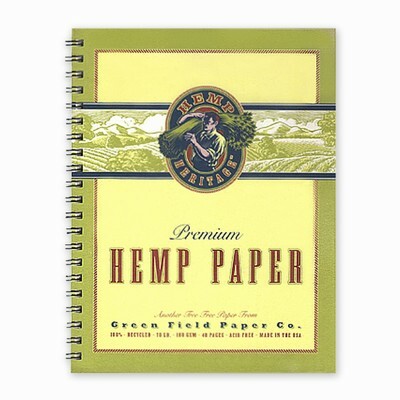 Drawing & Sketch Books, a Green Field Paper Company Hemp Heritage line. This book creates a contemporary look from a fiber that has been used to make paper for nearly 2,000 years! Suitable for a wide range of media including pastel, charcoal, watercolor, gouache, pen and ink. The mini book measures 3" x 4.25" and features 15 pages of 70# (180 gsm) Hemp Heritage® paper. The small book measures 4.25" x 6.5" and features 35 pages of 70# (180 gsm) Hemp Heritage® paper. The medium book measures 7" x 7" and features 40 pages of 70# (180 gsm) Hemp Heritage® paper. The large book measures 8.5" x 11" and features 40 pages of 70# (180 gsm) Hemp Heritage® paper. The front cover is printed using soy inks on Green Field Paper Co's 110# Hemp Heritage® paper and the back cover is a heavy recycled chipboard. Bound with natural stainless steel wire. Hemp is a fast-growing alternative to trees and its sinewy fibers have been used to make rope and paper for thousands of years. This historical plant holds great promise as a renewable tree-free source of fiber for the future. Green Field Paper Companies Hemp Heritage® paper is made in the USA by pulping Canadian-grown hemp fiber blended with post consumer waste. This paper is state-of-the-art in style and environmental responsibility. They are proud to be the only US manufacturer of paper made with North American hemp fiber and we're happy to offer you their exclusive Hemp Heritage products. This is the future of recycled paper: combining the best of tree-free and recycled fiber and the result is a premium quality paper with an elegant laid finish. Unlined Journals, a Green Field Paper Company Hemp Heritage line. The playful woodblock illustrations on the cover of Green Field Paper Co's Hemp Heritage® Small Journals are printed in full color on extra-heavy cover stock. The pages inside feature our 24# text weight Hemp Heritage® paper with an elegant laid finish. Unlike the flimsy feel of commodity wood-based paper, the Hemp Heritage® 24# bond has a look and texture all its own. Whether at work or play, these books will enliven the creative energies within. All Unlined Journals* - Size: 5.5" x 8.5", 75 unlined pages. Bound with stainless wire. 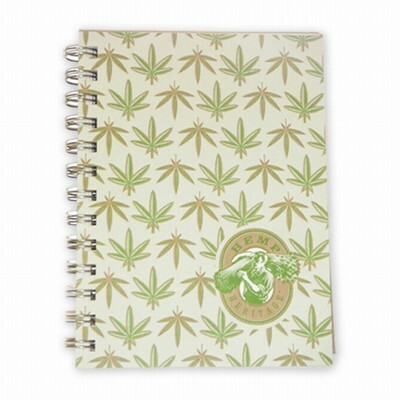 *Except Cannabis Sativa Journal - Size: 5" x 7", 70 unlined pages. Bound with silver wire. Currently out of Earth Journal. Hemp is a fast-growing alternative to trees and its sinewy fibers have been used to make rope and paper for thousands of years. This historical plant holds great promise as a renewable tree-free source of fiber for the future. Green Field Paper Companies Hemp Heritage® paper is made in the USA by pulping Canadian-grown hemp fiber blended with post consumer waste. This paper is state-of-the-art in style and environmental responsibility. They are proud to be the only US manufacturer of paper made with North American hemp fiber and we're happy to offer you their exclusive Hemp Heritage products. This is the future of recycled paper: combining the best of tree-free and recycled fiber and the result is a premium quality paper with an elegant laid finish. 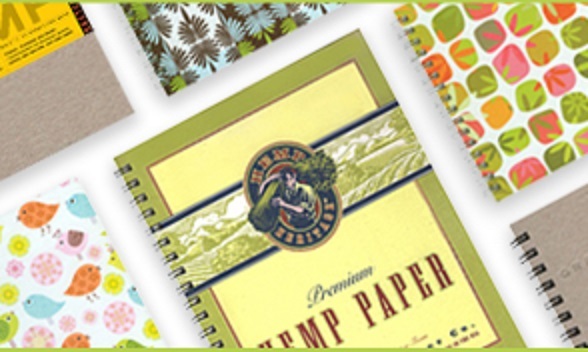 Stationary and Paper Office Supplies, a Green Field Paper Company Hemp Heritage line. Business Cards: Based upon the number of requests Green Field Paper Co has had had for smaller-run quantities of business cards on their Hemp Heritage® paper, they have developed these ultra-finely perforated sheets. Their 70# card stock in a package of 10 sheets gives you 100 business cards. Perfect for the start-up business or those in transition. Perfect when partnered with the matching Hemp Heritage® stationery to convey the message to your associates that you are environmentally conscious. With one side smooth and the other a classic European laid finish, you have the option to print one or two-sided. This sheet is compatible with the Avery® #8371 and #5371 templates found in most word processing software. Envelopes: The perfect companion to Green Field Paper Co's Mini Ream is the box of 50 #10 envelopes. The packaging is same chipboard box material as the Mini Ream. These #10 business size envelopes were converted from Hemp Heritage ® 24# text and feature an elegant square flap. Mini Ream of Paper: This premium quality Hemp Heritage ® paper is available in a 200-sheet mini ream in 24# Bond for letterhead. Natural white color. Presentation Folders: This folder measures 9" x 12" and has 2 inner pockets with slits for a business card. Available in a pack of 5. Natural white color. Printable Postcards: Our new Hemp Heritage® printable postcards are an easy and fun way to share your photos with family and friends! Each pack contains 12 4" x 6" printable postcards made from 110# (300 gsm) Hemp Heritage® paper. They have a matte finish and are a slighlty purer white than our ream paper, which makes them a perfect canvas for printing photos. As always, the paper is acid-free, chlorine-free and archival quality. Resume Kit: Show your commitment to your career and the earth by utilizing Hemp Heritage® fine quality paper composed of 25% hemp and 75% post-consumer. 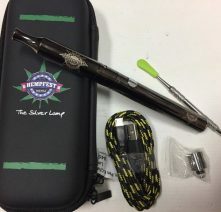 This kit has everything you need to make a great first impression and follow up with your prospective employers. Each kit contains fifteen 24# 8.5" x 11" sheets, ten 24# #10 business envelopes, two 70# micro-perforated business card sheets(20 blank business cards), three 70# blank folded A2 note cards, three 24# A2 envelopes, and one 110# blank presentation folder. Inkjet and laser printer compatible. Natural white color. Stationary Set: (Currently Out of Stock) Have a little fun with your letterhead... This set features 12 8.5" x 11" sheets of Green Field Paper Co's Hemp Heritage ® paper with 10 #10 business size envelopes. A great way to spice up your resume or anything you feed your printer. Guaranteed to stand apart upon arrival from the deluge of ordinary mailings! Inkjet and laser printer compatible. Natural white color. Hemp is a fast-growing alternative to trees and its sinewy fibers have been used to make rope and paper for thousands of years. This historical plant holds great promise as a renewable tree-free source of fiber for the future. Green Field Paper Companies Hemp Heritage® paper is made in the USA by pulping Canadian-grown hemp fiber blended with post consumer waste. This paper is state-of-the-art in style and environmental responsibility. They are proud to be the only US manufacturer of paper made with North American hemp fiber and we're happy to offer you their exclusive Hemp Heritage products. This is the future of recycled paper: combining the best of tree-free and recycled fiber and the result is a premium quality paper with an elegant laid finish. 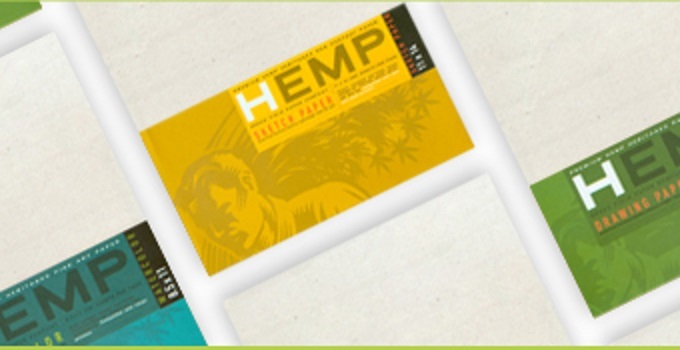 Paper Artist Packs, a Green Field Paper Company Hemp Heritage line. Drawing Paper: Now available in a versatile 70# (180 gsm) drawing weight. It features a lightly textured European laid finish and is recommended for pen and ink, watercolor, and a variety of media. Available in 8.5” x 11” - each pack contains 20 sheets. Natural white color. Acid-free, chlorine-free and archival quality. Inkjet printer and laser printer compatible. Sketch Paper: Now available in a popular sketch weight (90 gsm). Featuring an elegant European laid finish, this paper is ideal for charcoal, pastel, pencil, and even light wash. Available in 8.5” x 11” - each pack contains35 sheets. Natural white color. Acid-free, chlorine-free and archival quality. Inkjet printer compatible. Watercolor Paper: Now available in this extra heavy 110#(300 gsm) watercolor weight. Watercolorists love the rough texture on both sides of each sheet. Available in 8.5” x 11” - each pack contains12 sheets. Natural white color. Acid-free, chlorine-free and archival quality. Inkjet printer compatible. Hemp is a fast-growing alternative to trees and its sinewy fibers have been used to make rope and paper for thousands of years. This historical plant holds great promise as a renewable tree-free source of fiber for the future. Green Field Paper Companies Hemp Heritage® paper is made in the USA by pulping Canadian-grown hemp fiber blended with post consumer waste. This paper is state-of-the-art in style and environmental responsibility. They are proud to be the only US manufacturer of paper made with North American hemp fiber and we're happy to offer you their exclusive Hemp Heritage products. This is the future of recycled paper: combining the best of tree-free and recycled fiber and the result is a premium quality paper with an elegant laid finish. Lined Journals, a Green Field Paper Company Hemp Heritage line. These new journals feature four different patterns that are letter-pressed onto a thick recycled chipboard cover. Measuring 5.5" x 7.5", these journals contain 70 sheets of Green Field Paper Co's exclusive 24# (90 gsm) Hemp Heritage® paper. Each sheet is college ruled on one side for writing and blank on the back for sketching and doodling. The pattern continues on the back cover with the Hemp Heritage® logo and information about the hemp paper. Bound with black wire. Hemp is a fast-growing alternative to trees and its sinewy fibers have been used to make rope and paper for thousands of years. This historical plant holds great promise as a renewable tree-free source of fiber for the future. Green Field Paper Companies Hemp Heritage® paper is made in the USA by pulping Canadian-grown hemp fiber blended with post consumer waste. This paper is state-of-the-art in style and environmental responsibility. They are proud to be the only US manufacturer of paper made with North American hemp fiber and we're happy to offer you their exclusive Hemp Heritage products. This is the future of recycled paper: combining the best of tree-free and recycled fiber and the result is a premium quality paper with an elegant laid finish. Greeting Cards, a Green Field Paper Company Hemp Heritage line. These classic cards from Green Field Paper Co are printed on Hemp Heritage 110# card stock using soy based inks. Hemp Heritage paper is made from fibers of the hemp plant. This historic plant holds great promise as a renewable tree-free source of fiber which can help end the radical destruction of the earth's remaining forests. Packaged in a clear recyclable boxed set. Each contains fine quality recycled envelopes that compliment the card. The back of each card has the classic Hemp Heritage logo and reiterates the importance of using tree-free paper. Each set has 8 cards/8 envelopes. Hemp is a fast-growing alternative to trees and its sinewy fibers have been used to make rope and paper for thousands of years. This historical plant holds great promise as a renewable tree-free source of fiber for the future. Green Field Paper Companies Hemp Heritage® paper is made in the USA by pulping Canadian-grown hemp fiber blended with post consumer waste. This paper is state-of-the-art in style and environmental responsibility. They are proud to be the only US manufacturer of paper made with North American hemp fiber and we're happy to offer you their exclusive Hemp Heritage products. This is the future of recycled paper: combining the best of tree-free and recycled fiber and the result is a premium quality paper with an elegant laid finish.